Character. Cost: 2. STR: 1. 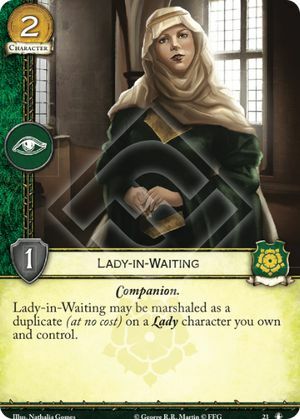 Lady-in-Waiting may be marshaled as a duplicate (at no cost) on a Lady character you own and control. The Road to Winterfell #23. Lady-in-Waiting's ability can only be used when she is marshaled during the marshaling phase. It does not work during the setup phase, or if Lady-in-Waiting is put into play by a card effect.